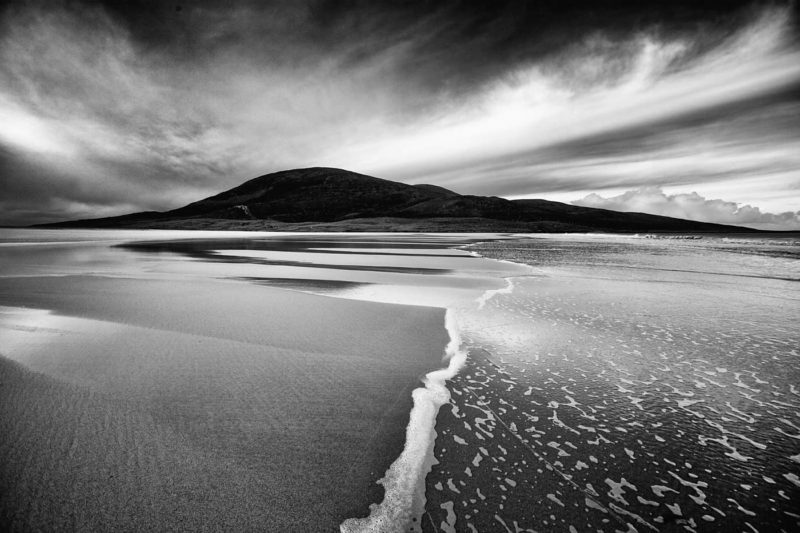 Our occasional series of interviews with landscape photographers living and working in Scotland continues. David Lintern talks with the singular Harris based artist Beka Globe. Tell us about first arriving on the island. Why did you go there as a child, and what made you come back later in life? My parents took a lifestyle choice; my artist father Steve Dilworth needed to be in a place that fed his soul, and allowed him the time and space to explore and create. I returned for similar reasons; to focus on my work, to be a photographer in the sense of an artist not in the commercial trap. Compared to the rest of the Hebrides, what’s different about Harris that inspires you? 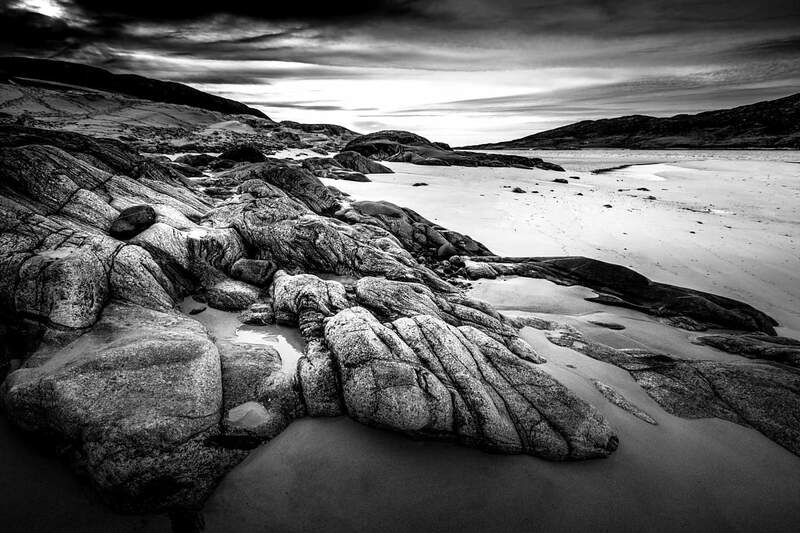 The Isle of Harris has everything: “Bonsai” Scotland, landscape diversity and raw elementalism. Mountains, glens, varied coastlines, moorland, islands, coves, dunes, the atlantic, the minch, big skies, glaciated gneiss, geology and wildlife. Do you have a favourite place on the island? Many, for different reasons. At the moment, Cravadale for its isolation, and the Clisham for its imposing presence. You studied photography and darkroom at Napier University in Edinburgh – in what ways does this inform what you do now? Taking time, framing the shot, thinking carefully, seeing the picture before I take it… and then the post production – working the light, shaping tonality, building the image from the raw negative… the process is very much the same, but the technology is different – cleaner, less chemicals, and made in the light, not in a dark and confined space. So you’ve switched over to digital completely? Digital has enabled me to make a living from producing solely my own work, developing my own visual language, and enabled my work to be accessible in terms of people buying it. It has been a great liberator and I don’t see myself going back to film and darkroom in the near future. You cite early influences Ansel Adams, Paul Strand and Hiroshi Sugimoto for their landscapes, portraits and seascapes respectively. There’s a little of everything there – darkroom tech, the energy of the natural world, and something more human, about community. Are there photographers working now that you admire, and if so – who are they and why do you like their work? 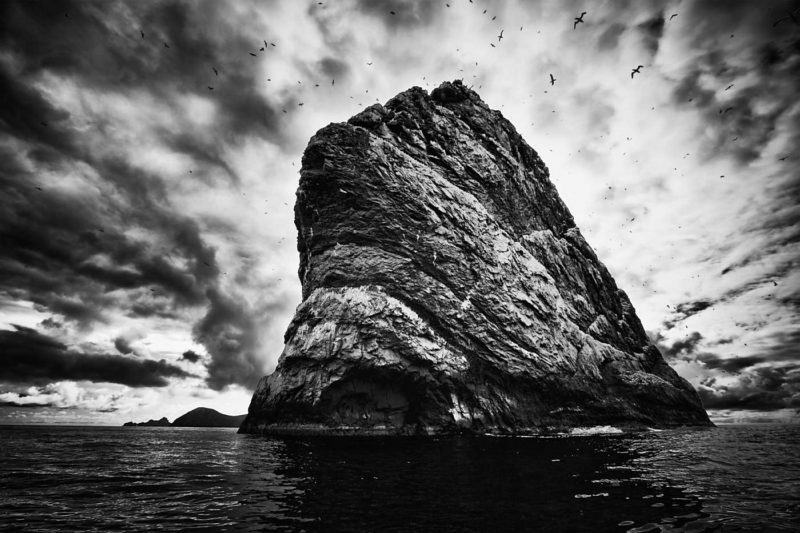 Ragnar Axelsson – He has focussed and dedicated his work to the Arctic for 40+ years. His work is really powerful yet sensitive. But I am really only interested in my next series of photos. There is a lot of talent out there but also an awful lot of ‘noise’ with everyone jumping up and down wanting to be ‘liked’ and ‘shared’. After university, where did you travel and what did you photograph? I went to the USA, mainly the desert regions both professionally as a location scout for a film and as a fine art photographer in my own right. I also produced a body of work in NZ with the Maori Moko – Tattoos. Returning to the UK I worked in the camera department in Film and TV for a few years but found it creatively depressing and the challenges were not creative challenges, but the commercialism and the industry itself, and a pretty aggressive, male dominated one at that. So back to Harris I came, to an infinite landscape within a small island, and the time, space and freedom to continue with my own work. And the Harris work – this feels less intensely focused than Kilda – more about your everyday experiences to me. What’s different about it for you as compared to your other work? Harris is my home, I live it, and can pick up the camera and go and shoot anytime, which has enabled me to develop a different kind of intimacy with the place, I often return to the same location during different conditions and seasons, to discover new elements, feelings, essences of place. It is my muse, and offers me a continuous process. 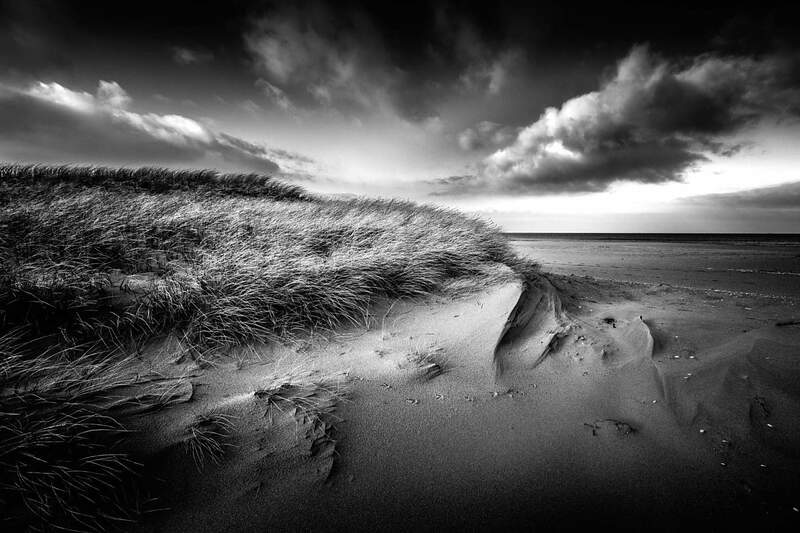 The arts writer Georgina Coburn talks about your landscape photography in relation to ‘threshold spaces’. 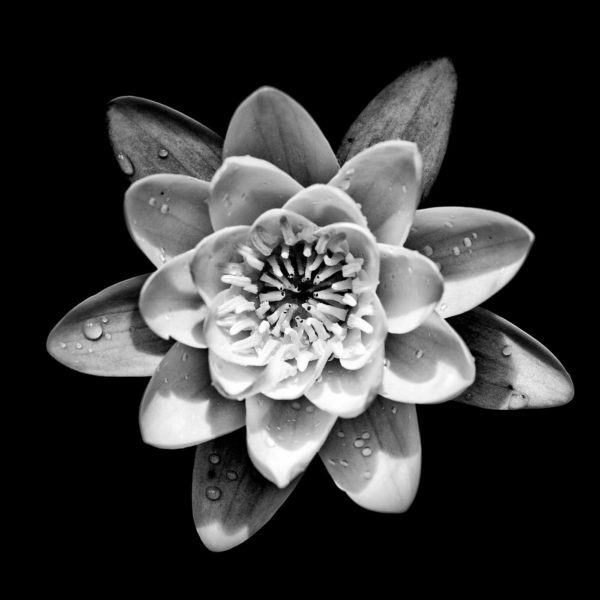 Your flower portraits feel very different to your previous work, and don’t seem to answer that description so obviously. Can you talk about why and how they were made? The flowers were about going deep, into the detail, the structure of life, the organic side of Harris, still very much part of the landscape, but on another level. Everything is connected and I see the flowers as a whole new way of looking, from the perspective of a bee…. They were taking with natural daylight in super macro, and in some cases using multiple stacked exposures to create a different perspective. The latest book – Land Sea and Sky – seems like a compilation or a summing up of the work so far, is that fair? Were new photos made for this or is it a pulling together of the previous strands? ‘Land Sea and Sky’ is a collection of the some of the work I have done since returning to Harris. Partly due to the success of the previous book, and a desire to single out my favourite images. There was also a demand on the previous book – I was fortunate that it sold out and there was an appetite for more. Many people who buy prints would like one of each, so the book enables that in some way. The Book also draws a line in the sand, so I can now move onto new series of work. Can you describe the process of making your books? Producing a quality photo book is a lot of hard work. Fortunately my partner Nickolai is a talented graphic designer with many years experience in Publishing. The hardest part of the process for me was the edit, this requires others eyes, as being the photographer you can be too close to your own work and find it hard to exclude certain photographs. The book was printed by an Art Book Specialist, and the specification was very high, Quality paper, Special Inks, duotone printing to ensure very exacting demands of reproduction. Also the binding and finishing were done beautifully. It was a big investment but I am delighted with the result. You can’t do it alone – thanks to my partner and our print manager, together we produced a very high quality result. Which part of your photography you do find the most challenging and why? There are many challenges, one of which is the selling. I am a bit of a purist and only want to take the photos, and then leave that side to someone else! My work is also technically challenging. I like my blacks to be black and whites to be white yet still have full tonality. Many ‘professional’ or ‘serious club members’ can be critical of this aspect of my work. I am not worried though, I do my own thing and am interested in creating a feeling, not compromising to the traditions and expectations of a particular scene or convention. Personally, there is no challenge in getting in “the zone” – I just have to find the time between publishing books, selling prints and being a busy mother! The studio-gallery you co run – The Mission House – is pretty unique, even amongst the other artist spaces on the Isles. What did you hope to achieve by setting it up, did you manage it and what’s next for the gallery? It’s a Creative Space on the Edge of the Atlantic. We wanted to create a vessel for our work/life. We often think of it as our ship, and we do sail pretty close to the wind at times, but we have our ship and we have our open ended mission or creative voyage. This has enabled both me and my partner Nickolai to cover some distance in terms of our work, and developing a global audience. More so than we could have in London or elsewhere, where the overheads can prevent you from ever leaving port, or even having a vessel for that matter. We are continuously developing work and continue to refer to this place as more a Working Studio than a Gallery. You mentioned to me that you were working on a new project about the mountains in winter? How is it going and what is next for your photography? The mountains are vast, and demand much time and effort. This winter I ventured out and began with great excitement, but also realised that there is much work to be done, literally mountains to climb. This is great as I am in no rush, and I love the space and isolation, of being out there. 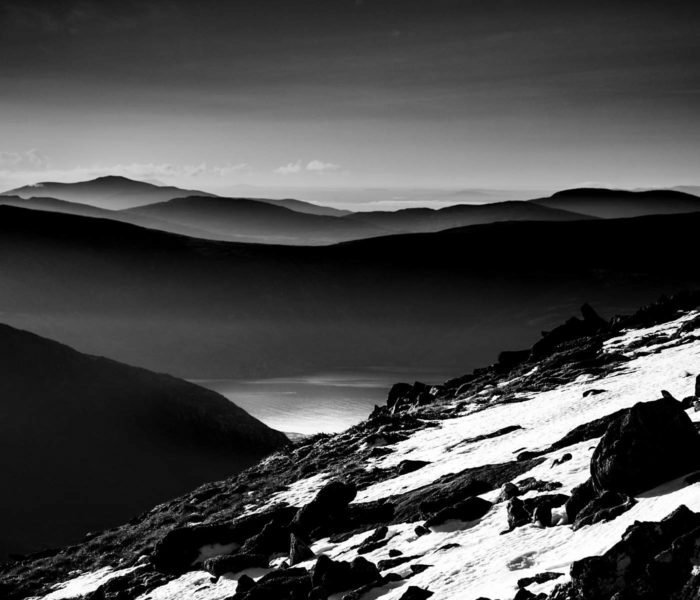 The feeling of being infinitely small, yet part of the vastness, connected but alone, which is all very metaphysical as any hillwalker understands. That’s what I hope to communicate in these new works. Is there anything else that I haven’t asked that you wished I had? Whatever you do, for me photography, should keep you excited, hungry for more, must propel you on, to the next frame, and feed your soul, otherwise it will show in the image. The work I love by others, and my own, has a real sense of “being” there, not just taking a picture, but a deeper sense of immersion, surrender and abandon. This feeling, I hope comes across in my images.